The Varun Dhawan-Anushka Sharma starrer earned Rs 8.30 crore on its opening day, despite slow business due to the Asia Cup 2018 finals. After a slow start, Sui Dhaaga: Made in India managed to gain speed on its first day at the box office. The Varun Dhawan-Anushka Sharma starrer earned Rs 8.30 crore on its opening day, despite slow business due to the Asia Cup 2018 finals. The film has been in the limelight for some time ahead of its release due to memes based on the film's trailer. "#SuiDhaaga has an encouraging Day 1... Had an ordinary start in the morning shows, but gathered momentum as the day progressed... Film lost out on a big chunk of biz due to #AsiaCup2018 finals, but should recover lost ground on Day 2... Fri Rs 8.30 cr [2500 screens]. India biz," trade analyst Tarun Adarsh wrote in a tweet. Launched a few days before Gandhi Jayanti, Sui Dhaag: Made in India is expected to perform well at the box offices over the course of the weekend. As the effect of Asia Cup 2018 finals was evident on first day earnings, experts believe that the flick will see its earnings swell over the next few days. Even on its first day, it came out as the more popular choice for moviegoers with the other Bollywood release this week, Vishal Bhardwaj's Patakha only earning Rs 90 lakh. "While #SuiDhaaga is expected to grow on Day 2 and Day 3, its biz is expected to jump from Day 4 [Mon] *evening* onwards, since Day 5 [Tue] is a big national holiday: Gandhi Jayanti... A strong total is on the cards, if its target audience [families] throng cineplexes," Adarsh further said. 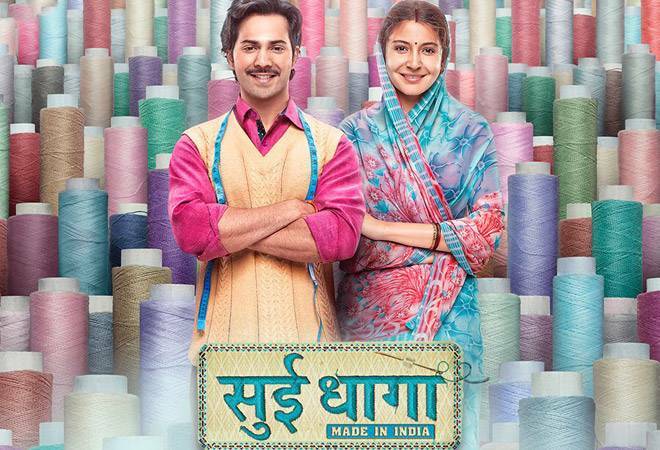 Directed by Sharat Katariya, Sui Dhaaga is the story of Mauji (Varun Dhawan) and Mamta (Anushka Shama), a married couple who aspire to establish their own tailoring business. The gullible couple learn the hard way that not everyone is as honest and kind-hearted like them. The movie proceeds to show how they struggle to achieve their dream. Sharat Katariya who helms the film is known for his previous movie - the delightful Ayushmann Khurrana and Bhumi Pednekar starrer Dum Laga Ke Haisha. He has also written movies like the Bheja Fry films and Titli. "At the core of Sharat Katariya's new movie, Sui Dhaaga, lays a very simple principle - sab badhiya hai. It is, in fact, this oft-repeated phrase that binds the movie together. It is also with this same feeling one would leave the movie theatre because sab badhiya hai," BusinessToday.In's Anwesha Madhukalya wrote in her review of Sui Dhaaga.